Major resurfacing works have been pencilled in for the M6 and M58 interchange. But motorists are being told that the project around the Orrell junction should not prove to be too disruptive. 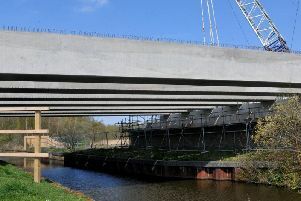 Overnight closures for junction 26 should only last from Monday, February 12, to Friday, April 6, between 8pm and 5am. But the prohibitions will be extended up to 7am on Saturdays and Sundays through this period, according to the Highways Agency. The initiative will also see carriageway markings repainted, worn-out parts of the motorways repaired and defective traffic sign and main lights, road studs and traffic detector loops replaced, alongside any other general maintenance. Eastbound and westbound sections of the M58, between junctions five and six, will be closed off, along with the northbound and southbound links of the M6 around the Orrell junction, with all associated slip roads, between these times. Highways England official David Logan, in an official notice, says that diversion signposts, enabling motorists to avoid the area, will be installed on both of the motorways and local roads for a sufficient period of time beforehand. Drivers are being warned though that the scheme may continue beyond April 6, if there are still works to be completed.